LOS ANGELES – The Los Angeles County Board of Supervisors has appointed current Orange County Undersheriff John Scott as interim Sheriff of the Los Angeles County Sheriff’s Department. Scott will assume command of the Department following Sheriff Lee Baca’s retirement, effective this Thursday (Jan. 30). “With considerable experience in law enforcement and strong leadership qualities, John Scott will be a superb interim sheriff to lead the department until voters elect a new sheriff,” said Supervisor Michael D. Antonovich. Scott has over 40 years of experience in law enforcement, and began his career with the Los Angeles County Sheriff’s Department in 1969. As a deputy, he patrolled the Lakewood Station area. In 1974, he was promoted to Sergeant and held assignments at Firestone Station, the Special Enforcement Bureau and the Emergency Operations Bureau. Following his promotion to the rank of Lieutenant in 1984, Commander Scott took assignments at Men’s Central Jail, Carson Station, Field Operations Region II Headquarters, the Office of Emergency Management, Employee Relations, and was the Executive Aide to the Assistant Sheriff. In 1995, he took command of Carson Station following his promotion to Captain. In June 2001, he held the rank of Acting Commander, leading the Custody Operations Division, North Facilities. 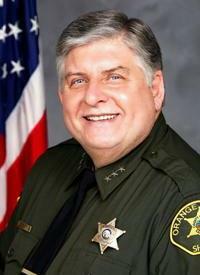 Following his retirement from the Department, Scott was brought into the Orange County Sheriff’s Department by Orange County Sheriff Sandra Hutchens in 2008 to serve as Undersheriff. View Scott’s curriculum vitae here. 2 comments for "John Scott appointed interim LA County Sheriff"
Coming from Orange County, the first priority should be taking his position on what happened with the Kelly case. We don’t need that kind of brutality in our Sheriff Department, and it needs to be known from the start that the brass won’t tolerate that kind of behavior. I was wondering about that myself Eric.